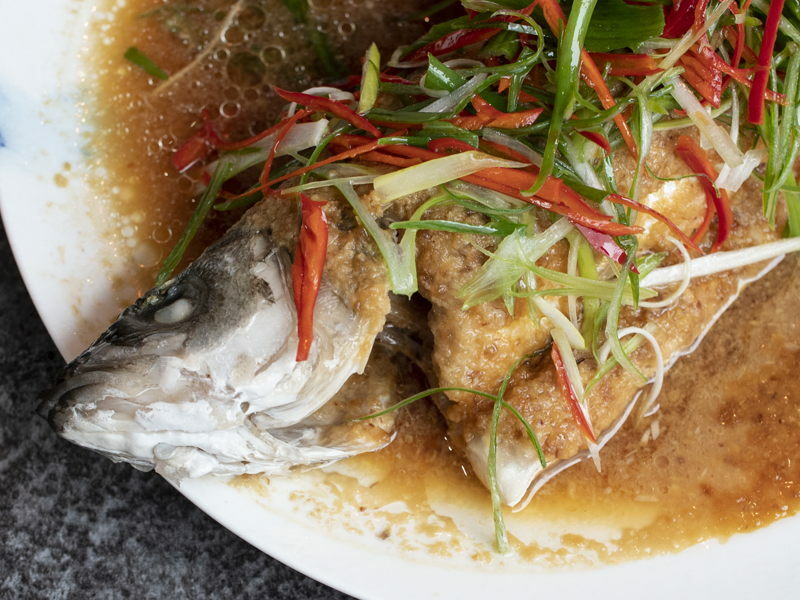 From chef Jeremy Pang, this quick and easy Chinese-style steamed fish recipe uses Tao Cheo, or fermented soy bean paste, to accentuate a sweet saltiness in the dish. Make your paste! Using a teaspoon, peel the ginger before finely slicing it into matchsticks. Next, finely chop your garlic and add it, the ginger, dry fried shallots, soy bean paste, plum sauce, sesame oil and 2 tbsp of water into a food processor. Blend until you achieve a smooth paste. (Hint: if you find it difficult to peel your garlic, try dropping the cloves into a bowl water and then, on a chopping board, smashing them with the side of a knife! Make sure to mind your fingers). Clean the fish and place on a large plate. Spoon the paste generously over the top and set the dish aside, ready for steaming. Turning your wok up to a high heat, place your plate of fish carefully on top of the steam stand and cover with a lid. Steam for 8-12 minutes, dependent on the size of your fish. While the fish is steaming, finely slice your spring onion. To julienne the chillies, first halve them longways before scraping out the seeds and finely slicing the flesh into short, thin strips. Place the spring onion and chilli into a bowl of ice water and set aside. Once the fish is ready, remove it from the wok. Scatter over a generous amount of the refreshed red chilli and spring onion over your fish, then in a clean wok heat 1-2 tbsp vegetable oil to smoking point and pour over the spring-onion-chilli mix. Lastly, douse the fish in light soy sauce and serve! Sign up to our Newsletter today to get our recipe of the month. Enter your details today and get offers and updates direct to your inbox. By signing up to our newsletter, you agree to our Terms and Conditions. Please make sure you have read and accepted the Terms and Conditions.